19/09/2011 - Team Lucidi Motors' weekend has been spoiled by qualifying in Vallelunga, stage of the sixth round of the Italian Formula 3 2011 Championship. On Saturday, in the decisive half hour to decide the starting grid Victor Guerin set the seventh fastest time (1'30.698), while Kevin Giovesi was ninth (1'30.838) followed by Edward Cheever, eleventh in 1'30.936. 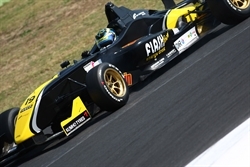 Giovesi produced another strong recover in race one, after the one scored in Adria two weeks back, and at the end of lap one he was fourth a position that he kept until the chequered flag. Positive was also Guerin's race as he climbed up from seventh to fifth but then was forced to give away two positions in the final stages, while Cheever got into the points thanks to the tenth place. The second race welcomed the podium scored by Guerin, constantly growing and third at the end of a tight race. Into the points were also Cheever, eighth and Giovesi, ninth. "After a positive start in free practice we had a weekend full of up and downs, and the final result has been spoiled by a troubled qualifying. Giovesi proved once again to be good in recovering, while Guerin got another podium. Cheever started a bit more on the back and therefore he unavoidably struggled a bit more to climb up the pack". The Italian Formula 3 Championship will be back on track next 2 October at Mugello.